Let me just start out by saying, I’m honest in my own opinions with my food posts. If I say something is yummy, I mean that with every taste bud on my tongue, I think it really is good. So in all fairness, if I say something is crap, then to me, well… it’s crap. Okay, now on to the post. My older sister and I are fairly similar. We have a lot of the same likes and dislikes. Since we both love the Riddick movies, Pitch Black in particular, when Riddick came out, we made ourselves a movie date. While we were waiting for the movie to start, I started telling her about this brownie recipe I found in my latest issue of Muscle and Fitness Hers magazine. They looked fabulous. I just couldn’t get past putting cottage cheese in my dessert. Then again, I cannot fathom cottage cheese in or on anything. I hate the stuff. The cottage cheese gives the brownies more protein than a “regular” brownie. So, that coupled with the benefits of cocoa powder, it had me curious. Could this be a healthy, tasty treat? And my sister had a point when she said that I already had all the other ingredients I needed, what was $2 on a small container of cottage cheese? After our typical Sunday family dinner, I set forth to make what I had dubbed Cottage Cheese Brownies. Pre-heat oven to 325-degrees. Coat an 8-inch-square baking pan with coating spray. Place egg, egg whites, cottage cheese and vanilla in a food processor and process until smooth (45 seconds). Add melted chocolate and process another 15-20 seconds or until the mixture in uniform. In a medium mixing bowl, combine flour, cocoa, baking powder and salt. Add egg mixture and stir until combined (it warns that you not over mix). Spread batter in the prepared pan. Bake 18-20 minutes (it also warns you here not to overcook either). 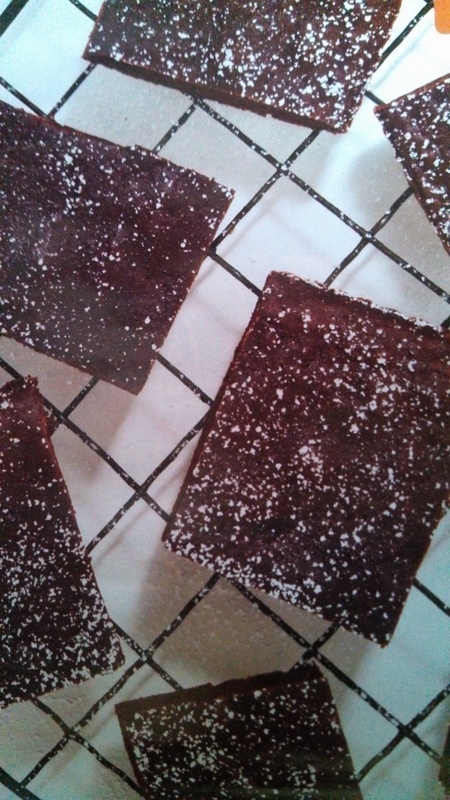 Cool on a wire rack, cut into 12 squares and dust with powdered sugar. Now let me just start out by saying, the batter itself was delicious. After sliding that pan into the oven, I couldn’t resist a lick of the spatula (I know, bad girl, raw eggs… yadda, yadda…). It gave me a little excitement that I was in for a dang good treat. Then my timer went off at 19 minutes, because you know, I always pick the middle-of-the-road time on all recipes (it seems the safest bet). Pulled the pan out, stabbed the slab of chocolate with a toothpick and groaned in frustration. It needed way more time, and my stomach was growling at me for chocolate. Back in the oven it went for another five minutes. Timer went off, repeated the process, discovered that it still needed more time. Now, this on a recipe that specifically says DO NOT OVER COOK. Okay. I know for a fact my brand new oven is dead on in the temperature department, so it’s not my oven. Needless to say, I ended up cooking the brownies for 30 minutes before the toothpick wasn’t a gooey mess. Leaving something with that many eggs in it, half raw, especially dripping batter raw, is not a good idea. I let them cool on a rack, cut them into pretty little squares and dusted them with sugar. Happily took one on a napkin, plopped myself on my sofa and while I waited for a new episode of BBC’s Copper to come on, I sampled my Cottage Cheese Brownies. Really? All that anticipation for nothing. Even my own dog, who is the Hoover Vacuum of dogs, wouldn’t have anything to do with them. Because I’m a cheapskate and stubborn, what I cooked will get eaten. But this recipe has been scrapped. Tossed in the “Do Not Ever Make Again” pile. … on to the next recipe I suppose. This was a great read and extinguished any curiosity i had to create brownies with cottage cheese.